Every Kinda People: Party Paradise? Utländska turister på besök i Sverige med förväntningar om en Astrid Lindgren-idyll, riskerar att bli rejält besvikna. ”Vårt första intryck av Sverige var en campingplats i Malmö med högljudda EU-migranter". -Der kom næste chok. I metroen var der næsten ingen mennesker som så ud til at være svenske. Otte ud af ti i vognen talte arabisk eller et afrikansk sprog. Vi vidste selvfølgelig godt, at ikke alle svenskere har lyst hår, men at næsten ingen havde skandinavisk udseende, det havde vi ikke drømt om. Der var også meget rodet, og vi så flere vagter løbe rundt i gangene, fortæller Jutta. Parret oplevede, at der var tiggere overalt. -Vi så endda en tigger-kvinde ved indgangen til en kirke. Det ville vi aldrig opleve hjemme i Tyskland. Tiggeri er forbudt foran butikker og indkøbscentre, og politiet har ret til at køre dem væk. Men der er også mange flere her end i Frankfurt. 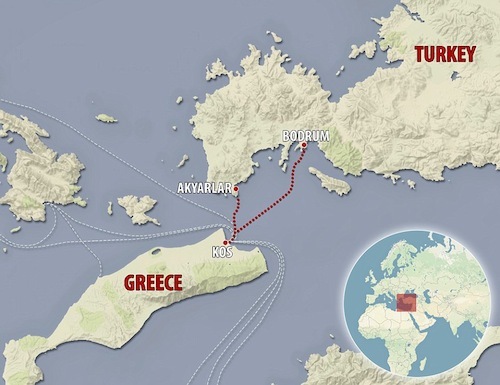 1 - The "refugees" disembarked happy and triumphant, having crossed in very little time and without obstacles the six kilometers of sea separating this Greek tourist attraction from the Turkish coast of the Aegean Sea, no less a tourist attraction. All of this was completely visible. 2 - Their first concern was to contact their families and friends using cell phones in perfect working order and to send many selfless. 3 - They were clearly well-dressed, in possession of money, well-fed, demanding, declaring at once their impatience with Europe in providing them with housing and jobs. 4 - The women were wearing the hijab; it seemed obvious that they were all Muslims. They said they had come from Syria. 5 - In conformity with the instructions of the Greek government as announced by the "pro-sovereignty" Socialist party Syriza, a visa for a stay of six months in Greece would be immediately granted them in order that they might move about freely in the country and therefore in our border-free Europe. 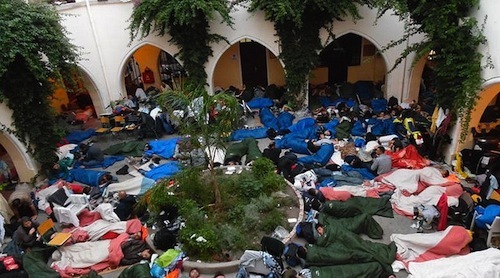 6 - These "refugees", it would seem, encountered no difficulty from the Turkish authorities. Once they had crossed the border, they were able to move rapidly to Kos, several hundred kilometers from Syria. From the BFM-TV report there is no reason to believe they encountered difficulties from the Islamic State. But this case, presented as a simple example of a vast reality, illustrates again what everyone knows, namely, beyond the dissimulation of rhetoric lies the complicity of the Turkish Islamist State with the Islamic State of the new calif Al-Bagdadi. Between these two entities the border is of course impossible to reach for Christian refugees, but it is totally open for all the oil traffic in one direction, and for everything the Islamic State freely buys in Turkey and via Turkey, in the other. It is open as well for jihadists, from Europe and elsewhere. The reality is that the complicity is total between the genocidal killers of yesterday and those of today. It is the continuity of the Islamic-Young-Turks and Daesh. The truth is that is if the Islamic State can easily take in these international jihadist brigades with Turkish complicity, it can also in return, and with the criminal unaccountability of the Greek government, permit these terrorists to enter into Europe. För Grekland och Italien gäller det att bevaka territorialgränserna och att flytta ut dessa. Kaos på Kos: Migranter vill ha mat.